Last weekend, Syrian forces continued operations in Aleppo City and neighbored areas. 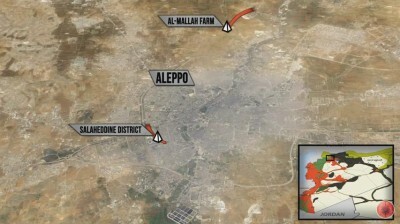 Following advances in Salaheddine District and al-Mallah farm area, the loyalist troops are now advancing in the city. An expected sub-objective of the operations is to divide the militant-controlled areas destroying the militants’ logistics and creating number of small pockets to defeat militant units in isolation from each other. Any successful offensive operations of the pro-government forces in Aleppo City will face an antagonism of the Western block on both diplomatic and military levels, which means the incensement of the propagandistic campaign in main stream media and supplies to militant groups operating in the area. The ongoing discussions on providing anti-aircraft weapons to militants are a part of this scenario. However, this would be possible only in case if the moderate militants are able to control a significant part of the province including Aleppo City. Meanwhile, the Syrian Arab Army (SAA) and allies are conducting operations in the Eastern side of the Khanasser-Aleppo highway. The decision was made after ISIS units attacked the SAA’s positions in strategic heights of Shabith and Al-Qaliya which overlook the villages of Atshana, Kharbeh Zobd, al-Toubeh and Akil. The security of supplies through the Khanasser-Aleppo highway is an important element of the ongoing operations in Aleppo City. On Saturday, the SAA liberated al-Sin air base near Damascus. The operation was coordinated with an offensive aimed on liberation the hilltop village of Tal Sawwan in the East Ghouta. According to pre-military reports, the SAA almost liberated the village. It had been controlled by Jaysh Al-Islam. In the Latakia province, the Syrian forces – the SAA, the NDF and the SSNP – launched a fresh offensive on the town of Kabani in the Kurdish Mountains. Heavy clashes are ongoing there. On April 14, the Iraqi Security Forces (ISF) liberated the town of Hit the province of Anbar province, following 2 weeks of the urban warfare with ISIS militants. The ISF entered the town on April 4. On April 18, the Iraqi F-16 fighter jets conducted airstrikes against the ISIS headquarters in the Tal Kayf district northeast of Mosul. Pro-government sources report that at least 17 militants were killed in the air raids, including Ahmed Qasim al-Farahat, an ISIS financial official.